While many individuals in the U.S. live where they could spend years in jail for cultivating cannabis, others are able to grow freely. Of the 30 plus states that have medicinal cannabis programs and the 10 states that have legalized adult consumption, there are many that also allow for home cultivation. Some however are not as lenient as others. If you are looking to move to a state where you can legally and freely grow, check out the list below which includes the 5 best states in the U.S. for growing cannabis at home. Maine legalized medical cannabis in 1999 and voters also approved a recreational market for adults in 2016. Thanks to these changes in the law, adults over the age of 21 are able to grow. Laws allow them to cultivate up to 6 mature plants, 12 immature plants and be in possession of unlimited seedlings in their residents. They must, however, be grown in a locked and enclosed environment unless being transported. There is a 12 mature plant limit per household, however, municipalities have the option of allowing up to 18 plants per household for personal adult consumption. Per the Michigan Medical Marijuana Act of 2008, a caregiver with a registry identification card is able to cultivate cannabis. The law allows them to cultivate up to 12 plants for each registered qualifying patient that they are specified as the primary caregiver for by the state program. Patients are not allowed to cultivate cannabis themselves and cultivation for personal adult recreational consumption is also not permitted. Caregivers are able to cultivate up to 72 cannabis plants total in an enclosed and locked environment. In Nevada, both medical cannabis and recreational cannabis for adults has been legalized and dispensaries are operational. 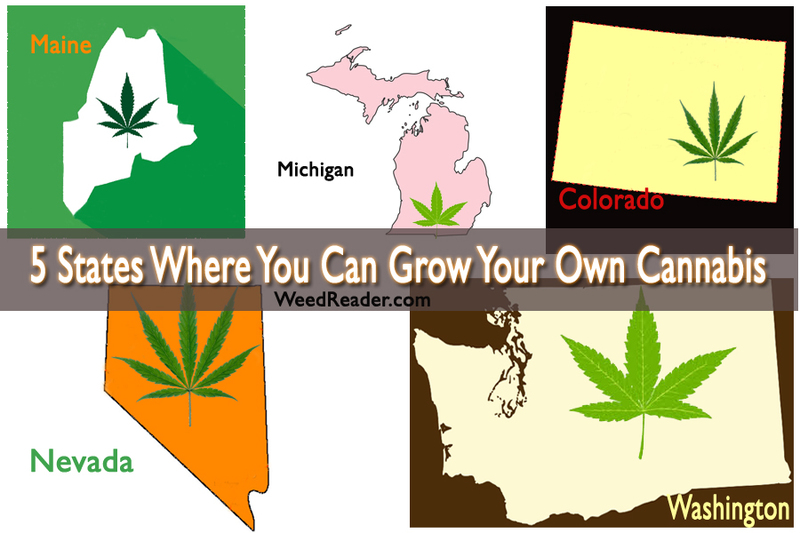 In addition, if you live more than 25 miles from a dispensary, you are able to grow your own. For adults, there is a 6-plant max limit with up to 12 plants total for a household. For medical cannabis patients who live more than 25 miles from a dispensary, they are able to grow up to 12 mature cannabis plants at once in the privacy of their own home. Medical cannabis patients in the state of Washington are able to grow up to 6 mature plants for their medical use. In certain circumstances where a healthcare professional believes this is not sufficient, that limit can be increased. The maximum plant count that a medical cannabis patient in the state can receive is 15 plants. Unfortunately, if you are not a medical cannabis patient in the state you are not able to grow. Colorado was the first state to legalize an adult retail cannabis market. They also allow for growing your own at home. Any adult resident in the state of Colorado is allowed to cultivate up to 6 cannabis plants at any time. This is as long as no more than 3 are in the mature/flowering stage at one time. There is, however, a 12-plant limit per household for adult personal consumption. Colorado residents that opt to grow their own are required to do so in an enclosed and locked environment. At one time, Colorado allowed for medical cannabis patients or their assigned caregivers to grow up to 99 plants per patient. This law however changed in 2017. The new law allows for medical cannabis patients to grow the same amount of plants at home as recreational consumers. Patients, however, can receive approval for a higher plant count, though if they do, it must be assigned to a medical cannabis dispensary as their caregiver and cannot be grown at home. Check out a full breakdown of cultivation laws throughout the U.S. here. Can you grow where you live? What do you feel the laws surrounding home cultivation should be? Let us know in the comments below!